I'm always on the lookout for new essay collections (new as in 'I haven't spotted them before', not as in 'just released'). I'm totally in love with this literary form and over the years I've sampled quite a few masters. Nadine Gordimer. Orhan Pamuk. Salman Rushdie. 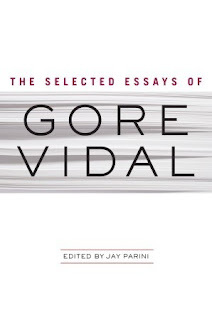 The list goes on, even longer than yesterday because now it also includes Gore Vidal. 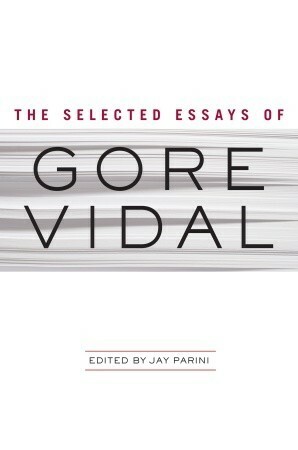 Vidal was a prolific essayist (with more than 200 pieces to his name) so The Selected Essays of Gore Vidal should include the best of the best, at least in theory. I am in no position to compare the editor's - Jay Parini's - selection to the rest of Vidal's works, but as it is, the book reads rather well. It is divided into two main sections: literary criticism (mainly American novelists) and political commentary. I enjoyed them both, despite the fact that I'm not a big fan of fiction in general and American fiction in particular. That alone tells you something about Vidal's talent. Gore Vidal's writing is the ultimate proof that you can be impolite or even rude, politically incorrect, direct, eloquent, intelligent AND published. He obviously wasn't worried about hurting people's feelings and for that alone, I'm almost in love. Compared to today's 'criticism', full of polite euphemisms and meaningless blah blah, he shines. Funny thing, I was almost tempted to seek out the books he ranted about. 'Positives only' approach doesn't work for me, but give me a good, intelligent, negative review and I instantly feel like checking if the reviewer was right. When it comes to political and social commentary, Gore Vidal was witty, passionate, too often spot-on right and thus - quite depressing. I don't necessary agree with all his views (e.g. that prostitution is ok, because the ladies enjoy their work), but even so his eloquent bitching was a delight to read. When it comes to strictly political issues - well, I keep hoping that Vidal's opinion about US 'defense' spending and military operations is shared by many, many Americans. Let's just say that politicians probably didn't like him very much. Overall, a very decent collection of essays. Highly recommendable.